This is a coupon for the Monkisee online store. Teach your baby with Monki See, Monki Doo products! Intellectual Baby offers a fun and interactive DVD and flash cards that teach babies to read. Their store has lots of other great learning toys to make learning to read fun. Intellectual Baby offers interactive DVD and flash cards that teach babies to read. Their store has lots of other great learning toys to make learning to read fun. Monki See, Monki Doo products make it simple to teach babies to read. Their products are specifically designed to engage babies from 3 months through 3 years old. 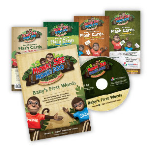 The Baby's First Words DVD have babies reading and recognizing 40 words with the help of their new monkey friends, Howie and Skip. The DVD includes upbeat music, puppet shows, poetry and more. The bright, full-color flash cards each contain a word and a picture, to help babies make more associations when learning new words. Intellectual Baby also have a variety of toys available at their online store which help babies learn to read. To learn more about Monki See, Monki Doo , visit their official website here.